Led by Shaunna Morrison of the Deep Carbon Observatory and DCO Executive Director Robert Hazen (both at the Carnegie Institution for Science in Washington, D.C.), the paper's 12 authors include DCO colleagues Peter Fox and Ahmed Eleish at the Keck Foundation sponsored Deep-Time Data Infrastructure Data Science Teams at Rensselaer Polytechnic Institute, Troy NY. "The quest for new mineral deposits is incessant, but until recently mineral discovery has been more a matter of luck than scientific prediction," says Dr. Morrison. "All that may change thanks to big data." 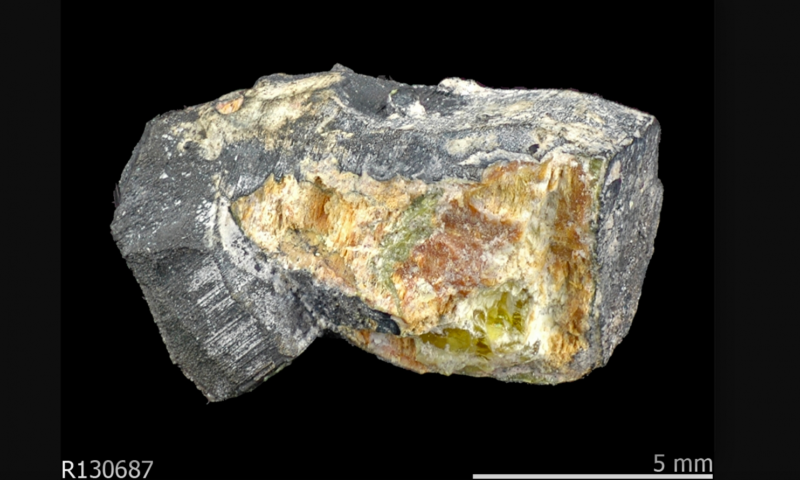 Humans have collected a vast amount of information on Earth's more than 5,200 known mineral species (each of which has a unique combination of chemical composition and atomic structure). Coupled with data on the surrounding geography, the geological setting, and coexisting minerals, Earth scientists now have access to "big data" resources ripe for analysis. Until recently, scientists didn't have the necessary modelling and visualization tools to capitalize on these giant stockpiles of information. "Big data is a big thing," says Dr. Hazen. "You hear about it in all kinds of fields—medicine, commerce; even the US National Security Agency uses it to analyze phone records—but until recently no one had applied big data methods to mineralogy and petrology." "I think this is going to expand the rate of mineral discovery in ways that we can't even imagine now." From those insights it's a relatively simple step to predict what minerals are missing from scientific lists, as well as where to go to find new deposits. 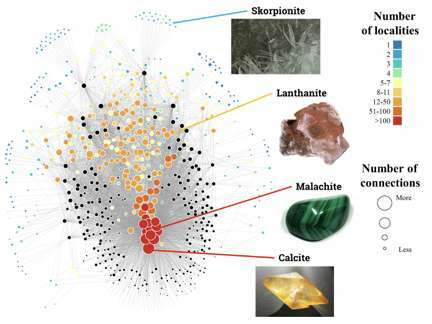 Says Dr. Hazen: "Network analysis can provide visual clues to mineralogists regarding where to go and what to look for. This is a brand new idea in the paper and I think it will open up an entirely new direction in mineralogy." Already the technique has been used to predict 145 missing carbon-bearing minerals and where to find them, leading to creation of the Deep Carbon Observatory's Carbon Mineral Challenge. Ten have been found so far. "We have used the same kinds of techniques to predict that at least 1,500 minerals of all kinds are 'missing,' to predict what some of them are, and where to find them," Dr. Hazen says. Says Dr. Morrison: "These new approaches to data-driven discovery allow us to predict both minerals unknown to science today and the location of new deposits. Additionally, understanding how minerals have changed through geologic time, coupled with our knowledge of biology, is leading to new insights regarding the co-evolution of the geosphere and biosphere. " The investigators also performed an analysis of common minerals in igneous rocks-those formed from a hot molten state. The mineral networks of igneous rocks revealed through big data recreated "Bowen's reaction series" (based on Norman L. Bowen's painstaking lab experiments in the early 1900s), which shows how a sequence of characteristic minerals appears as the magma cools. Mineral networks will also serve as effective visual tools for learning about mineralogy and petrology - the branches of science concerned with the origin, composition, structure, properties, and classification of rocks and minerals. Researchers could use these tools to explain how Earth's minerals have changed over time and incorporate data from biomarker molecules to show how cells and minerals interact. "Minerals provide the basis for all our material wealth," she notes, "not just precious gold and brilliant gemstones, but in the brick and steel of every home and office, in cars and planes, in bottles and cans, and in every high-tech gadget from laptops to iPhones." "Minerals form the soils in which we grow our crops, they provide the gravel with which we pave our roads, and they filter the water we drink." "This new tool for understanding minerals represents an important advance in a scientific field of vital interest."